Quiet: The Power of Introverts in a World That Can’t Stop Talking, by Susan Cain is a fantastic book that is valuable not only to the introvert, but the extrovert. There are things you know about yourself, but don’t fully understand until you hear someone else describe in detail the fabric of your personality. Not only do I understand myself better, but also my husband and my oldest son. If all the noise in this crazy life is getting to you, this is a book for you. 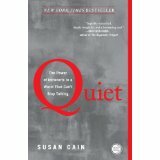 While I don’t agree with everything Susan Cain writes, she did a great service for all the “Quiet” people.